168 pages, 5.5" x 8.5"
Do you need to get away from the pressures of the world and the gaze of Big Brother for a while? Do you plan to live or work in a remote area where you need to be able to take care of yourself? Do you want to develop the skills to remain undiscovered in the back country - even if others are searching for you? If so, Wilderness Evasion is for you. 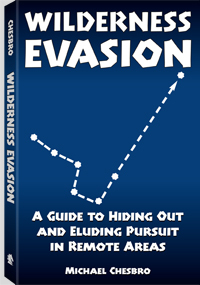 You don't have to be on the run to benefit from this unique survival book: it includes skills you can use every day in your real life. Whether you're heading into the woods for evasion purposes or just a little relaxation, you should know what this manual can teach you about survival medicine, emergency caching, communications, food and water procurement and storage, counter anti-tracking, and the psychological aspects of being alone in the back country, among other things. The ability to remain alive, self-reliant and in control of your environment - even in the remotest of areas - is one that few people possess these days. Learning the skills taught in this book can keep you alive for as long as you need to be in the wilderness. For academic study only. Michael Chesbro is a retired senior counterintelligence agent from the U.S. Department of Defense Special Operations. He holds degrees in security management and jurisprudence and is a graduate of the Federal Law Enforcement Training Center. His other books include: The Complete Guide to E-Security, Freeware Encryption and Security Programs, and Privacy for Sale.